I was asked recently by a friend (and elemetary school art teacher) to create a short video for her students of my life as a professional illustrator: How does one day unfold for me; where do I collect inspiration; what sort of tools are specific to what I do; what DO I do - and what ever do I even look like?! These are big questions, with potentially complicated answers, and the truth is - I do a wide variety of things in order to keep the lights on and Oscar well fed. It seems I have fewer and fewer "typical" days... but if you asked me to generalize for a moment and describe a single, quintessential day, I'd quickly use words to paint a picture of what's been neatly put into moving images above. As luck would have it, I am studio-mates with a world-class videographer (and all around amazing and very talented individual). Doubly fortunate for me, Steve (Stebs) Shinnerer of Paper Fortress Films had been interested in shooting an "A Day With..." portrait of me (as part of a larger creative series) since last fall... The timing finally right, we coordinated a day of interviewing and shadowing through multiple locations (including my beloved Franklin Park Zoo), and a few weeks later, the final edit was ready for it's debut - in front of dozens of eager first and second-graders... in Missouri... The resulting 4-minute project is darn near pitch-perfect - I actually find myself pausing to thank my sweet stars for this life every time I watch it (plus, it's chock full of cool animals... so, WIN). As a supplement to the video, I took one of the sketches started during that one, lovely day, and developed it into a finished coloring page, so that each child in my friend's class could create their own work of art, inspired by an FPZ creature ("Azul", a hyacinth macaw, to be precise). Drawn in a similar style to a project I did for National Geographic.com years ago, the ink drawing is designed for easy print/download. 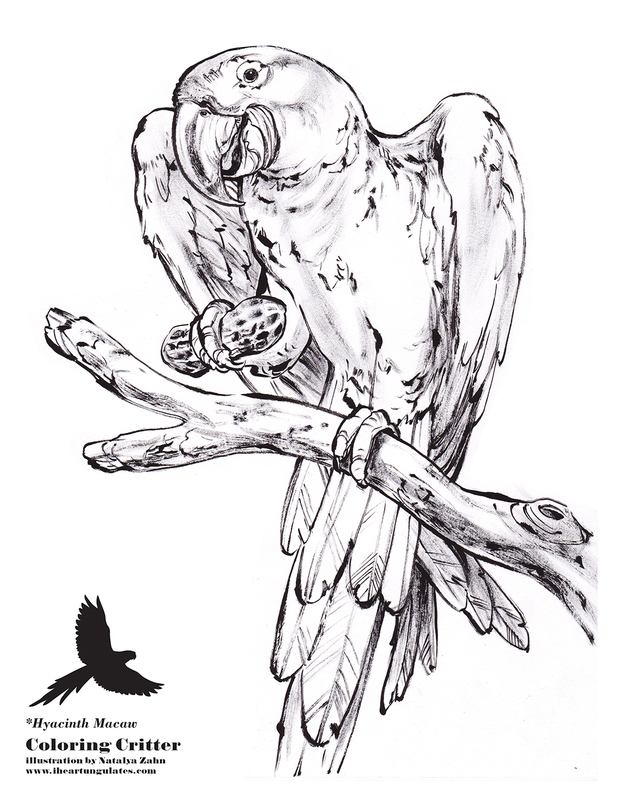 If you'd like to color your own parrot, just click on the image below and print from your browser, or save to your hard drive! I ran the 2013 Boston Marathon on behalf of the Franklin Park Zoo. That's right, I took on the fundraising challenge of running 26.2 miles with a charity that couldn't fit me better if it were hand-tailored to my every measurement. I ran with 2 other beautiful, strong women, each of us pledging to raise $5,000.00 by the end of the summer. The race may be over, but my fund-raising continues, and it's projects like the one above that make it crystal clear how important the Franklin Park Zoo is to the Boston community, and beyond. Perhaps especially in light of the tragic events at the end of the April 15th race, now is the time to support the institutions and organizations that enrich, enliven, entertain and educate this vibrant city. So, if you are inclined (and I would urge you to be!) PLEASE CONSIDER SUPPORTING MY MARATHON RUN with a donation. I trained for 3 months and put over 4 grueling hours on the race course - what can you do to make a difference in the lives of these animals and their tireless keepers? Our lives in the 21st century are increasingly dominated by moving images - powerful camera and editing technologies makes it possible to endlessly manipulate (speed or slow frames) and accentuate certain actions, ultimately exposing the intricate movement of everything from humingbird wings in flight to the precise tongue flicks that a cat uses to lap milk. It's easy to take the accessibility of this visual information for granted, but 150 years ago, things that moved faster than the human eye and brain could register in sequence were mysteries left to artists to interpret. In 1872, a popular debate arose regarding whether a running horse's feet were ever in fact all 4 off the ground (as they appeared commonly throughout Victorian horse-racing art), or whether the stride required at least one hoof on the earth at any given point. In an attempt to settle the issue with visual evidence made by a device that "couldn't lie" (the camera), former governor of California, and racehorse owner, Leland Stanford commissioned English photographer Eadweard J. Muybridge to produce proof. After much study, experimentation, and the development of new techniques involving multiple cameras and carefully placed triggers, Muybridge delivered an irrefutable answer in 1877: a single photographic negative (one in a series) of Stanford's trotting horse, Occident, clearly shows the horse "floating", not a single toe touching the ground below. Further photographic series' of Stanford's Thoroughbred, Sallie Gardner, proved that not only was there also an unsupported point in the stride of a galloping horse, but that it occurred while all 4 legs were tucked beneath the body, as opposed to stretched out front and back, as was the common artistic depiction. The success of Muybridge's efforts prompted many more studies, with many more types of animals and actions, generating hundreds of thousands of images. These experiments also resulted in the zoopraxiscope - a precursor to cinematography and the motion picture. Today marks the 182nd anniversary of the pioneering Eadweard J. Muybridge's birth. Muybridge's work fascinated me as a teenager and prompted numerous animated animal projects using tracings of his photos, and original drawings based on the studies. As a kid enamoured with anatomy, Muybridge's massive volumes of stills exploring the various gaits of dozens of different creatures, were a goldmine of reference imagery and inspiration for me. To this day my copy of Animals In Motion remains a powerful tool for researching form and gesture... So, a proper hat tip to Mr. Muybridge, for his incredible - and prolific - contributions to early scientific imaging and the arts. The fantastic little video above was made in conjunction with a 2010 Muybridge exhibition at the Kingston Museum. To read more, check out eye magazine's little commentary on Muybridge's role as an artist; explore social scandals and multiple name changes here; and go look something up today! - Google Doodle for the day is a lovely tribute. On October 5th, not 2 years since the epic BP fail off the Gulf Coast caused the Deepwater Horizon oil spill, oceanic environmental tragedy struck again - this time 12 nautical miles off the east coast of New Zealand's North Island, in the Bay of Plenty. The threat: a loaded cargo ship (the Rena) run aground, hemmoraging oil, periodically dumping shipping containers from it's dangerously listing decks, and on the verge of fracturing into pieces with the next storm surge. The catastrophe is now the worst in New Zealand's maritime history, and it struck cruelly during breeding season for many native birds, who will now have to deal with sticky black tar as poisonous nest decorum. In the scramble to clean up after such a devestating event, the desperately motivated can be counted on to get creative... With more and more oil-soaked birds washing onto New Zealand's beaches (over 1,200 casualties recorded so far) a unique and charming request was issued recently in an effort to aide the rescue and rehab of one of NZed's pluckiest avians - the penguin. What could these tiny tux-wearing birds need that trained wildlife cleaning crews couldn't provide? Sweaters! Yes, sweaters (aka "jumpers" in Kiwi-speak). You see, while waiting to be bathed (a thorough affair that can take over an hour per bird), there is a risk that ill, tar-soaked birds will try to preen out the gunk coating their feathers - injesting dangerous amounts of oil in the process. Sweaters provide a (jaunty) barrier between beaks and feathers - keeping oil out of penguin bellies - and they help warm birds that are highly stressed and uncomfortable, before and after being washed. Grist.org reports that this is not the first mass call for penguin wooly-wear... Apparently, in 2001, the Tasmanian Conservation Trust thought it wise to try to bank penguin jumpers in preparation for a possible disaster: what began as a goal of 100 sweaters ended up with the reciept of roughly 1,000 after the request went viral and knitters got busy. Similar efforts have been launched to aide oil-soaked penguins off the coast of South Africa as well. Above: an AP photo of a penguin sporting a jumper after a spill near Tasmania in 2000; a penguin, mid bath, photo from animaltracks.today.com (such a teeny little guy - so many blue latex fingers! ); and a clean penguin recouping at a wildlife center in Tauranga, photo by Bradley Ambrose/Getty Images. My travels around New Zealand this past summer were largely based out of Auckland - a few hours from Tauranga - and I had the pleasure of taking in the beauty of the Bay of Plenty coastline. My thoughts are with those who make this region their home. For photos of the Rena spill and it's effect on Tauranga beaches, see this gallery at the Guardian; read more about the spills effects on NZ's birds here; and see more pics of past penguin sweater endeavors here. - Cast on 36 stitches using 3.25 needles. K1, P1 to end of row. - Repeat this row 7 times. Change to 3.75mm needles and K2, P2 rib. - Continue until work measures 15 cms. - Decrease 1 st at each end of every row until 28 sts remain. - Make second side the same. - Transfer the 54 sts from both pieces to 3 of the set of 4 3.25mm needles (18 sts on each) and work a round neck in K1 P1 rib for 10 rows. - Stitch up sides to decreasing to 27sts (opening for flipper). Add elastic to the top and bottom to prevent the penguins getting out of them. Top: 15cm of elastic; bottom 17 cm (knots allowed). Flat elastic is okay. Here's to the crazy ones, the misfits, the rebels, the troublemakers, the round pegs in the square holes. The ones who see things differently. They're not fond of rules, and they have no respect for the status quo. You can quote them, disagree with them, glorify or vilify them, but the only thing you can't do is ignore them because they change things. They push the human race forward, and while some may see them as the crazy ones, we see genius, because the ones who are crazy enough to think that they can change the world, are the ones who do. The remarkable Steve Jobs, co-founder of Apple computer, had nothing to do with ungulates, or animals of any sort. He was a designer, a maker, a leader, and above all, a tireless visionary, but the influence of his passionate life's work (Apple) profoundly changed my life as an artist and designer, beginning with my family's first Macintosh: I was most fortunate to have a father who was, I suspect, waiting with baited breath for the invention of computers since he was a mere tyke... when the Macintosh was released, we had one. Well before Macs were available to me at school, I was spending countless evening hours completing homework with PageMaker and McPaint - stone age programs by today's standards, but at the time, they still shamed the black and green-screen IBMs in my high-school typing class. By the time I was 16, my parents had built their own graphic design business - powered by a small office of Macs - we had multiple Macs stationed around the house, and at that point, since I spoke Adobe as a second language, I became the first to apply to a number of my chosen institutions of higher learning with an interactive portfolio delivered on CD-ROM - all made on a Mac. Today, I write this post from the desktop G5 in my own illustration/design studio, with 2 Apple displays center stage, an iPod plugged in to my left, and my indispensable iPhone tucked into a sweater pocket. I have been branded, without a doubt, though rarely have I felt such brand loyalty more well deserved. RIP, Mr. Jobs. You didn't just change the world, you changed it multiple times over, and bettered it at every step. A literal combination of the Russian words "x-ray" (roentgen) and "self-publish" (samizdat), Roentgenizdat records were born out of underground cultural and political necessity. During the 1950s, while the western world was vibrating with a collective surge of intense music discovery (hello, rock and roll) the iron curtain over the Soviet Union prevented any of these sounds from legally entering the USSR. Vinyl, the medium of the day for pressing records, was nearly impossible to source economically, so records that did manage safe smuggling passage into the hands of hungry music lovers could not be easily copied and shared. The ingenius solution to this challenge came in the form of a plastic that was both common, and cheap (if not completely free via dumpster salvage): x-ray film. There is no single individual credited with the innovation, and word is not 100% clear on exactly how it was done, but some intrepid and enterprising collective supposedly put to use converted phonographs to "press" records into the discarded films - dubbing contrabanned sounds right over the gostly images of human anatomy. Roentgenizdat recordings were predictably less robust than their vinyl parent records, and the thinner plastic made the records tempermental to play, and much shorter lived, but they cost a fraction of the price of vinyl records, and they enabled the sounds of Little Richard, Elvis Presley, John Coltrane, and Thelonious Monk, among so may others, to be heard by millions. Roentgenizdat records were distributed through the blackmarket until an official Soviet government "Music Patrol" clamped down, eventually breaking up the largest distribution ring in 1959, and sending all of the leaders to prison. Even the KGB couldn't completely extinguish the Roentgenizdat movement, but with the increasing availability of reel-to-reel tape recorders in following years, music fans could duplicate tracks in their own homes, negating the need for a vulnerable blackmarket system. See this gallery for more Roentgenizdat images - clicking on the song titles will also allow you to listen to an mp3 of each recording. Read more Roentgenizdat history here, and here, and if you're interested in a more metaphorical angle, click here to listen to a lecture/discussion on the connections between music, image, and methods of reproduction, titled "Music on Bones" by writer/scholar Eduardo Cadava, who has written a book by the same name. Now, rock on. One of the more interesting dynamics of bird-watching, I'm learning, is that importance is given not only to the spotting and ID-ing of individual species (causing delight if it's one you've never seen before), but also to the location in which you've found it (causing delight if it's never been seen there before). Lucky beasts that they are, most birds have the ability to literally globe trot. Many make this an annual activity through the act of migration, along epic and predictable "flyways", but migrating or not, any bird that takes to the air risks finding itself lost in any number of directions. The ones who veer far enough afield become very interesting to anyone who can tell them apart from the rest of the feathered regulars in any given area. Last week, amid crowds of the uber-regular seagulls that speckle the beaches and boardwalks of New York's Coney Island, a stranger was spotted: if you don't know a Black-headed Gull from a Herring Gull, you surely wouldn't have noticed it, but amidst the white and grey mobs fighting for discarded french fries was a highly unusual (for the East Coast of North America) Gray-hooded Gull. Side by side, the differences in coloration between the Gray-hooded and a "basic" Gull are pretty darn obvious, but not dramatic - it would take a birder to pick this guy out... though in a place as populous as NY, it was only a matter of time. According to the New York Times, "A photo of the bird, Chroicocephalus cirrocephalus, was first reported on July 24 to eBird.org, a Web site run by Cornell University’s ornithology lab and the National Audubon Society." From there, word fanned out across birding websites and forums the world over, and dedicated birders from as far away as Chicago made haste to the beach in Brooklyn, hoping to catch a glimpse, and hopefully a great photo, of a bird that will make many "life lists" over the course of it's East Coast vacay. The Gray-hooded Gull's native range includes South America and Africa south of the Sahara - it has been officially recorded only once before in North America, on Dec. 26th, 1998, in Apalachicola Florida. So, while it may be but a variant of one of the most common birds in the States, genetically speaking, it's a great rarity here, and those who traveled over from even extended points west still saved themselves a few thousand miles to witness such a creature this far north. Above, THE gray-hooded gull (left) photographed amid the fried dough and pretzel carts this weekend, next to a Herring Gull (right), the most common of the gulls. Aside from the obvious grey head, notice the deep red beak and legs on the gray-hooded gull, compared to the fleshy-pink legs and yellow bill (with a distinctive red spot on it's underside) of the Herring Gull. Photo credits: Gray-headed Gull by Elliotte Rusty Harold; Herring Gull by Allison Frost. 'Tis but one step more to think one vote will do no harm. Today's the day, friends, you know what to do.